If ever there was a case study involving the value of a brand through the loss of its value through an overnight scandal (albeit one that took over 12 years to come to full light) this is one of the best, or worst as the case may be. For Buna High School’s sake, I’m very glad that they were able to divest themselves of at least the visual attachment to a now tainted (to put it mildly) image and have been able to establish their own, unique identity in their region of high school athletics. Not that anyone could have had the foresight to have even guessed that something like this might happen to any brand, but it definitely heightens the reality and liability that comes from associating one organizational entity with any other brand that is not within your control. It is exactly the inverse of why most schools that are tempted to “borrow” or be “inspired” by the current good brand image of any other sports-related mascot or brand, in order to benefit from the good design and good image that has been established. The flip-side of that coin, which is now in full-display in regards to Penn State, is that if anything ever does happen to tarnish a brand to that degree, it will also have its residual impact on whatever organization had thought to infringe upon the previous good will that had been created with that brand. All that is to say, that if any organization chooses to infringe upon another organization’s brand image in order to take advantage of whatever perceived positives there may be, that it has to take the good with the bad. And in this case, the bad is really, really bad. 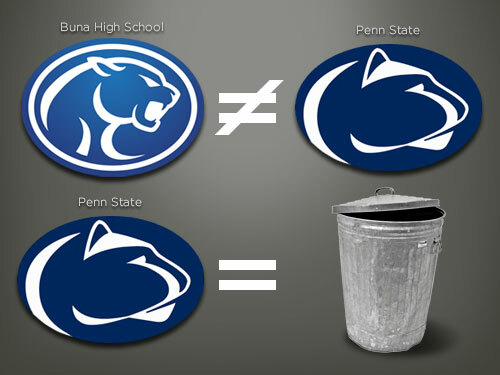 Thankfully, Buna High School does not have to share that bad image with Penn State any longer. Go Cougars! Buna High School is a high school. I would have thought the words “high school” would have been a good hint. I guess not. Buna High School is located in Buna, Texas, a rural community in Southeast Texas, and has a total enrollment of about 400 students. Penn State is bouncing back just fine from the scandal. Applications are at an all-time high, and the football recruiting is #2 in the nation at the moment. And here you are, Russell. You’re still irrelevant. It’s a good thing you took your swipes while you could, but that time was short-lived. Enjoy. With the benefit of hindsight, this was a rush to judgment. It was also a terrible blog post. I could have learned something about branding, but instead I received some really low-grade commentary. Thanks for the high-grade comment though!